As the end of the school year is getting closer, so is the time to present your final exams. This means that it's likely that you've already started preparing for your tests. However, if your study method includes highlighters, you should know how to employ them in the best way possible so they can help you learn successfully. For tips on the matter, continue reading the post below. For expert tutoring in Southgate MI that can help you ace your finals, call The Tutoring Center, Southgate MI at (734) 785-8430. First things first: don't rely too heavily on your highlighter. The problem with using your highlighter to study comes when you only use your highlighter to study. This is because simply making information stand out won't do much in your efforts to retain and recall said information. In fact, it can even be counterproductive, since you may get a false sense of confidence when you're highlighting. If you want to use your highlighter when you study, your best bet is to use it as an aid or a complement for another study method. For example, you can highlight your textbook after reading it a couple of times over. You can also use highlighters when taking notes: you can write down notes of certain information and then use your highlighter to make the most important bits stand out from the rest. A tip that you may not consider, but that can actually help you use your highlighters in a more effective manner, is to have a variety of colored highlighters. As you know, more often than not, highlighters come in that annoyingly bright yellow color. However, there's a wide range of hues to choose from: blues, greens, pinks, purples, oranges, and more. If you love color then this is good news for you, because you can assign a different colored highlighter to a specific assignment, type of information, or another element. For example, as you write your homework in your agenda, you can use highlighters to color code them (e.g. make use of a green highlighter to emphasize your math homework). When you're studying, use your highlighters for specific types of information (e.g. use a pink highlighter to go over names). These tactics will help you organize the information, which will make it easier to recall and retain. Call The Tutoring Center, Southgate MI at (734) 785-8430 to find out more information about their academic programs or to schedule a free diagnostic assessment. It's not uncommon for students to be studying or taking notes, and then using their highlighters to doodle or write. However, this can be a huge mistake that can actually derail your study efforts. This is because, the next time you're going over your notes, you'll be distracted by the brightly colored scribbles on your notebook, since they will pull your focus away from what you should be learning. To avoid this situation, you should keep yourself from writing or doodling with your highlighters. In order to prevent that, you should keep your school supplies nearby when you study. 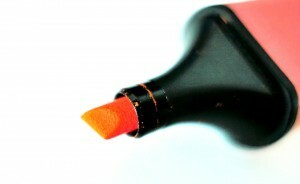 This way, instead of simply using your highlighter to write, you can put it down and grab your pencil. It's recommended, though, that if you like to doodle to increase your focus while studying, that you do it on a separate piece of paper, so the doodles in your notebook won't distract you. Lastly, something you should think about to successfully employ your highlighters is that when you highlight everything, nothing will stand out. This means that you should choose what you'll be emphasizing carefully, lest you want to be confused in a sea of yellow highlighter. A tip to ensure you don't overuse your highlighter is to start highlighting on the second or third run through a text. During your first read, you should assimilate the information, and really think about what's important in your notes or textbook. Then, after a second read, you'll be able to differentiate what you really need to learn and emphasize. This way, you'll have a clearer idea of what you should focus on. Reach your academic goals and ace your finals with one-to-one tutoring in Southgate MI. Call The Tutoring Center, Southgate MI at (734) 785-8430 for more information.